After graduating from secondary school, she studied Physics at Jagiellonian University in Cracow. 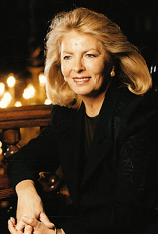 Since 1965 she has managed the secretariat of her husband, Krzysztof Penderecki. In 1990 she established the first private music agency "Heritage Promotion of Music and Art. ", and managed it until the middle of 1995. Since 1992, as an assistant to her husband, she has organized the Pablo Casals Festival in San Juan, Puerto Rico, where Krzysztof Penderecki is the artistic director. Elżbieta Penderecki is on the board of several foundations, including the European Mozart Foundation, which wound up its operations in December 1998 and had had its headquarters in Poland for four years. She co-organized this foundation and took an active part in the Advisory Committee and in the Programme Council. She assisted in the establishment of the Sinfonietta Craovia chamber orchestra, the official orchestra of the Royal City of Cracow. Being its patron, she has helped in the promotion and organization of their concerts. Since 1996 she has been Chairperson of the Cracow 2000 Programme Council (Cracow is to be European City of Culture in the year 2000). In March 1997 she organized the First Easter Beethoven Festival in Cracow. The year 1998 saw the second edition of this Festival. The Third Beethoven Festival, organized under the motto "Beethoven and the Great Romantics", will be organized in 1999. She intends to continue organizing this Festival. Elżbieta Penderecki became the artistic director of the Krzysztof Penderecki Festival, organized in 1998. The musical events of the year 1998 were held in Cracow under the patronage of her husband. In 1997 she initiated a series of musical performances entitled "Concerts of the Great Masters - Elżbieta Penderecki Presents". This series presented outstanding artists such as Mtislav Rostropovich, Jessye Norman and Simon Estes. The series was continued in 1998 with recitals by Barbara Hendricks and Stanislav Bunin. Among the invited guests for 1999 are Wienerakademie, Pinchas Zukerman and Marc Neikrug (14 April), Bella Davidovich, Galina Gorchakova and Sumi Jo. In November 1997, in cooperation with the Studio Art Centre she organized a charity concert for flood victims featuring the Sinfonia Varsovia orchestra, Lord Yehudi Menuhin, the National Philharmonic Choir and soloists Izabela Kłosińska, Arto Noras and Ewa Pobłocka. In November 1996 she was awarded the Kinght Cross of the Order of Merit of the Republic of Poland. In November 1997 she received the PRO MUSICA VIVA prize, awarded by the Maria Strecker Daelen Foundation in recognition of her outstanding achievements in Polish and international musical life. In January 1998 she became a laureate of Business Center Club award. In January 1999 she was awarded the Honorary Medal "For the Outstanding Services to the Cracow Voivodeship" from the Voivode of Cracow, Ryszard Masłowski. In the year 2000, on the occasion of Cracow being a European City of Culture 2000, she is planning to bring to Poland the New York Philharmonic, the Bundesjugend Orchester with Gerd Albrecht, the Norddeutsche Rundfunk with Christophe Eschenbach, Anne-Sophie Mutter, Il Giardino Armonico and others. She is planning to organize the first Pablo Casals Cello Competition in San Juan, Puerto Rico. Together with her husband, she is planning to organize a festival of music in Korea in 1999. A concert promoting great young talents will be one of the major events of 1999. A young violinist Ryu Goto will perform under the baton of Shiomo Mintz to mark the nomination of Mr. Mintz as Director of the Henryk Wieniawski Violin Competition in Poznań.